If you are a fan of video games or action movies, you must have encountered the concept of sniper teams consisting of two people – one for the shooting and one for spotting the target, so that the shooter can calibrate his aim to achieve its lethal effect. Wildlife spotting works on the same principle, with basically the same equipment, but for a distinctly less nefarious purpose. There is certain power and safety engendered when you have the ability to view an object miles and miles away as if it is just in front of you. When observing wildlife, this is even more important, because that is the only way to observe the animals without disturbing them, or not putting yourself in danger as well. Although spotting scopes are focused on land-based viewing, you can rest assured that they can also be used for astronomy hobby as well. After all, even the cheapest, low-tier scope today is light years ahead of the scopes used for hundreds of years to chart our tiny corner of the galaxy. Accordingly, a scope labeled as 15-40×50, will have magnification ranging from 15 to 40 times, with 50mm-sized lenses. Magnification is self-explanatory; the more the better. Although, you should keep in mind that magnification, along with bringing the object closer to your eyes, also greatly amplifies any motion. For binoculars this is a huge issue because you have to hold them with your hands, so many higher-end binoculars come with integrated image stabilization (similar to flagship smartphones). However, with spotting scopes, this is less of a concern as almost all of them can be affixed to a tripod. Consequently, if you plan to use the scope without a tripod, make sure it has the image stabilization feature. 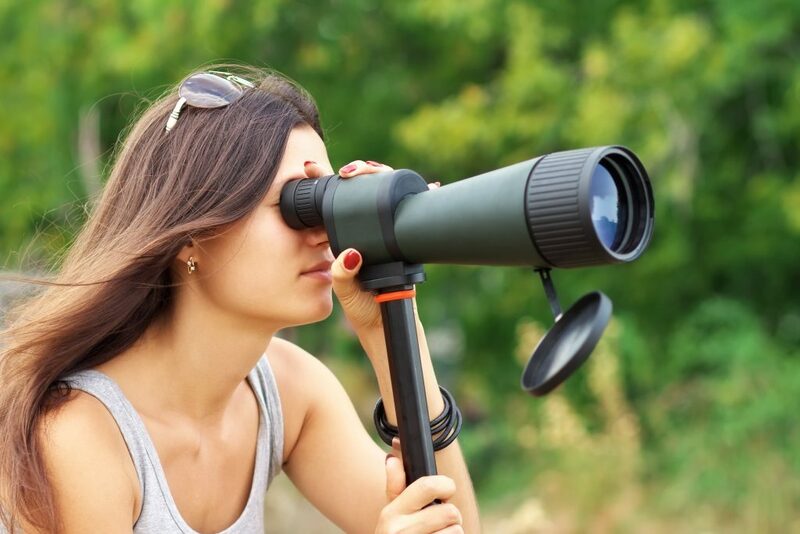 Furthermore, it is always better to get a scope with zoom magnification instead of one with fixed magnification, as this will give you much needed flexibility – spotting the object with a lower zoom, and then honing in on it with increased magnification. Lens size is the next critical feature to take into consideration. The larger the lens, the more visual data you will have at your disposal – more clarity, detail, color, and light. Unfortunately, this will make the scope heavier and bulkier, so it is a compromise only you can make. Angled scope has the viewer angled at about 45 degrees, which allows for much greater comfort and accessibility. Straight scope will have to be aligned with your eyes, with you crouching down or raising the tripod, but you can also do that with an angled scope. Therefore, one can hardly envision a situation in which straight scope would be a better variant. Additionally, angled scopes are easy to share in a group of people, where the height of people wouldn’t matter – taller people would simply have to slightly lean in more. With straight scopes this would not be the case, as you would constantly have to make tripod adjustments, thus make things awkward and uncomfortable for other people. The benefits of angled scopes don’t end there. If you need to scope for wildlife, like birds, at an elevated position, it is much easier to do so with an angled scope. And if you are into using scopes as your inspiration for sketching and art, you would be more comfortable doing so with just a quick glance through an angled scope. Two-step focus makes instant focus shifts – from close-up to infinity. Gradual focus allows you to gradually make minute focus adjustments until you are satisfied with the result. Frankly, this is a matter of preference, more than any objectively determined superiority or inferiority. Although most people nowadays buy everything online, it would be prudent to go in your nearest optics store to try out which focusing solution suits you better. Final note on focus is that you should be cognizant on the distance you will be viewing. Obviously, scopes are intended for viewing objects from vast distances, but sometimes you want to view fine detail of objects much nearer to you. For this reason, manufacturers now offer information on the minimum focusing distance for scopes. If you are bird-oriented spotter, focus under 20 feet would be a good idea. Glass quality is critical for your spotting enjoyment. It is tightly linked to the brand of the product, and you should always opt for either coated or multicoated glass, multicoated being at the higher end of pricing. The purpose of coating is to improve the transmission of light into your eyes, delivering all the clarity and detail you would need. Look out for online reviews of scopes, and if they mention chromatic aberrations – caused by lens dispersion. High-quality scopes, not necessarily of high price, will have ED glass which will significantly alleviate this issue. ED glass stands for ‘Extra-low Dispersion’. Those scopes will provide a much clearer and sharper image. Unfortunately, the nomenclature for this feature is not universal among manufacturers; some will have it under labels like APO, HD, XD…but always ensure that in the description of the scope the words ‘low-dispersion’ are mentioned somewhere. Likely, this feature will increase the price of the scope, but if you don’t get it, you will regret it. When you are buying a spotting scope, find out the details of the bundle: does it come with canvas covers, lens caps, tripod, carrying bag, etc. How long is the warranty would also be an important filter, as it signifies the quality and confidence of the manufacturer. In the end, although the convenience of buying a scope online is enticing, just based on reading reviews and descriptions, you should go that extra step and visit a specialized store. Only then you will you get to grasp if the size of the scope suits you, if the tripod is just right, what focus type suits you more, and every other factor you cannot experience through online browsing.